For weeks before Christmas the cooks at Windsor are busy preparing the Queen’s dinner for Dec. 25. The principal dishes are all prepared at Windsor, as the kitchen accommodation at Osborne is totally unequal to the task. The Queen’s plum pudding is the triumph of Windsor cookery. In an enormous caldron are placed the usual ingredients, well soaked in fine old Madeira or rum, and all the cooks take their turn in stirring round this huge mass — over 200 puddings are made at Windsor — and occasionally privileged persons are permitted to be present as spectators. The duly mixed mess is divided into the required number of puddings, which are then boiled for twelve hours. One of these puddings is sent to every one of the Queen’s immediate relatives and descendants. The mincemeat also involves considerable preparation; it is made according to a recipe of King James I. The ox from whose carcass the baron of beef for the royal table is to be cut is specially fed up, and in Christmas week the enormous joint is handed over to the tender care of the cooks. So big is it that it is placed before a roaring fire at 8 o’clock in the morning and exposed to the heat until 8 at night, when it is pronounced “done”. Afterward the royal monogram in shredded horse radish is imprinted on the joint, which is served cold. It does not appear on the table, but stands on the sideboard. The boar’s head always figures in the menu. Both the German Emperor and the King of Saxony invariably send a boar’s head to the Queen as a Christmas present, but the chef finds that an ordinary bacon head cooks better, so the tusks of the wild boar are fastened on to the head of a tame pig, whose appearance is further “made up” by fierce eyes and painted gums. The game pie is a huge pasty, in whose bowels is concealed a savory compound of woodcock, game, pork, bacon, eggs, spice &c.
Christmas presents for the Queen frequently take the form of delicacies for the royal table. The Czar of Russia keeps up the custom of his late father and sends a royal sturgeon. The Grand Duke of Mecklenburg-Schwerin always forwards a splendid paté-de-foie-gras encased in pastry, and resembling an enormous pork pie. 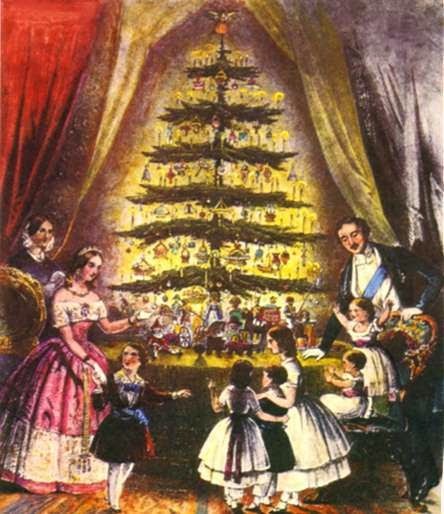 The Crown Princess of Greece sends her grandmamma a case of fine currants and spices and the Empress Frederick some German gingerbread, of which her father was very fond. The Emperor of Austria forwards a dozen bottles of his priceless Tokay wine. All these presents are sent to Windsor, and forwarded to the Isle of Wight, along with the other Christmas fare. The Royal yacht used for conveying provisions to Osborne when the court is there, is irreverently called “the milk cart” by the young Princes and Princesses. The Christmas fare is sent across Southampton Water in time to reach Osborne on Christmas eve. Such dishes as are to be served hot are either warmed up or prepared wholly at Osborne. Dinner on Christmas Day, as on other days, is served at 9 P.M. All the Queen’s splendid gold and silver plate is used. After the most substantial dishes have been disposed of Stilton cheese is served, and then comes dessert, which consisting of all the rare fruits of the season, is served on the famous Sevres set of plates and dishes, valued at £50,000. Music is provided by the royal band.